Yesterday the Ontario Energy Board (OEB) announced rates for the May 1- Oct 31, 2015 period. The rates are going up, on average, around 10.3% over last summer - as is the trend. Since 2007 summer rates have averaged 9.4% a year. 10.3% is a weighted average increase as each time-of-use (TOU) period is going up differently. The difference in TOU increases exhibits an ignorance about the factors driving pricing in Ontario's market, and the consistency of the increases over the past 7 years eliminates the uncertainty about why rates are going up. There are few more capable of breaking down cost components that I. Last summer's rate hikes were all due to renewables. This year much of the boost is due to some of the delayed costs OPG has now applied for (see Bruce Sharp's Invisible Gorilla). I suspect that when the government contracts of unnecessary supply drive the price up more than 10%, OPG is strangled; when there might be a brief pause in those costs, OPG gets some funding for it's variance accounts. Always, however, the costs are being driven by policy. Rates are going up because the powers that be want them to. They go up 10% because that's what they figure people will tolerate. We are closer to paying the real cost of energy than we have been in the past. This isn't an educated opinion, but a statement to identify one's tribe. Rates are going up because in this instance the quote comes from the Premier and she wants the rates to go up. Whatever the people are paying it isn't the real cost. This is a first principle of the tribe including Ontario's Wynne - and McGuinty. The unique stupidity in this latest rate hike is the distribution of the increase across time-of-use periods. The OEB chose to raise what they classify as "On-Peak" rates nearly 20% to encourage shifting to "Off-Peak" rates. I describe this as stupid because daily peak demand is now most often in hours the OEB classifies as Off-Peak. 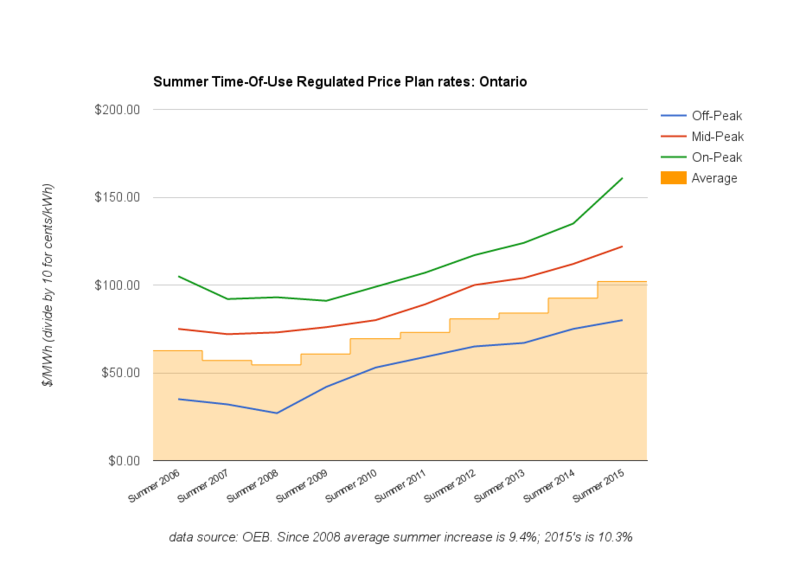 I won't dwell on the reasons for this in covering this rate hike, because I noted time-of-use (TOU) rates are conceptually poor in 2011 (Time-Of-Use Pricing), and I showed the expected outcomes occurring in March 2015 (Failed time-of-use electricity pricing in Ontario). I will show average hourly data, form the IESO, for the six OEB summer billing months in 2014 (filtering out days with no Mid and On-Peak hours). On-Peak hours are IESO hours 11-16. 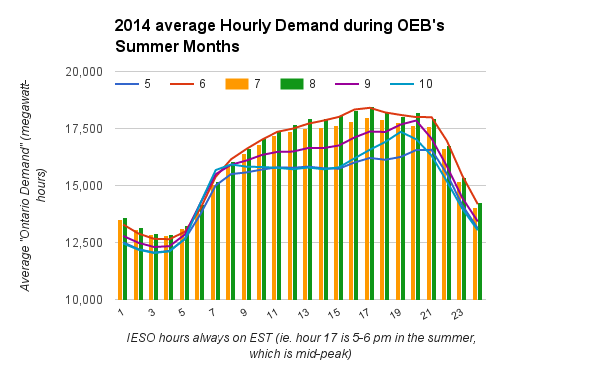 The average daily peak "Ontario Demand" in June, July and August is in the Mid-Peak hour from 5-6 pm (hour 17). 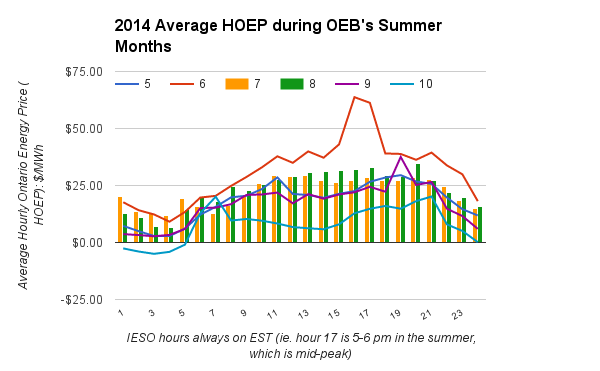 In May, September and October, the daily peak is, on average, in OEB "Off-Peak" hours. In the hottest months the move of peak "Ontario Demand" out of the "On-Peak" afternoon is probably due to growth of embedded solar generation, but the impact on the IESO's market is the same. In the market, it is the price that displays the relationship between supply and demand, and in 2014 only 2 months showed the highest average hourly price (HOEP) in "On-Peak" hours. June 2014 had an average hourly peak HOEP rate in On-Peak hours (the last hour), as did July (11 - the first hour); the other 4 months already experience peak hourly prices during the early evening off-peak hours the OEB wishes to drive more demand to. Why is the OEB making this change? The OEB is also introducing a new 2:1 ratio between on- and off-peak prices that will benefit customers who shift their use to the cheapest time period. This ratio shift was also recommended by Ontario’s Environmental Commissioner who called on the OEB to significantly widen the peak to off-peak price differential in his 2014 Annual energy conservation report, Planning to Conserve. The 2014 Annual Report of the Office of the Auditor General of Ontario also noted that the former ratio may not be sufficient to encourage ratepayers to shift their electricity use behaviour. The outgoing Environmental Commissioner is not in charge of rates, or math. The Auditor General is not in Charge of rates either. Her point was one reason smart meters couldn't pay for themselves was because they government would contract the supply to meet peak demand anyway. That's why rates go up every year. The relationship between supply and demand is increasingly impacted by the wind or sun available. The OEB advises that the,"typical Ontario TOU household uses about two-thirds of its power during off-peak hours, and the remainder in near equal amounts during mid-peak and on-peak times." 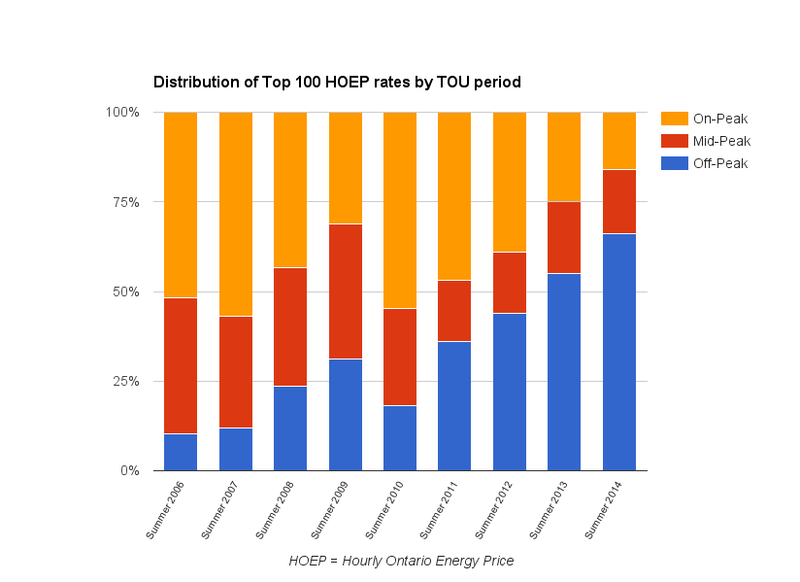 In the previous summer rate period, that matches the distribution of the top 100 HOEP rates. The OEB's category of hours is functionally pointless. Most troubling is the IESO knows all this. Off-Peak hours have become peak hours because the government regulated that "off-peak" start at 7 pm - before that meddling "Off-Peak" did not begin until 11 pm. This latest pricing strike me as designed to provide a methodology for blaming ratepayers for the 10% hike they'll experience regardless. It is simply a tool to blame the victims of higher prices who might be so boorish as to complain about ever increasing costs when all that is happening is that fundamental truth that one can only get "closer to paying the real cost of energy."